After the depressing news about the demise of Google Reader, here are some good news from Google. 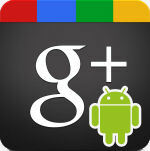 Yesterday, an update for the Google+ Android app had been released and after several previous updates just with some minor improvements and fixes, the new version 3.6 came with some amazing surprises. For starters, the posting stream in both the circles and the communities has been slightly revamped without losing the “magazine”-look. Completely new plus-, share- and comment-buttons in style of the web interface have been added and even thumbnails of the commenters are displayed in the stream overview. The dynamic reformatting of the posts also seems to work much better now, although the right and left margins have become a little larger. But most importantly, the app now scrolls vertically in landscape mode instead of horizontally like before. There are also two special changes in the streams which photographers on Google+ will love: 1) images are no longer randomly cropped into a square format and 2) tapping on an image directly leads to the gallery view while tapping on the post header calls up the single post view. The single post view has also been very much improved, now showing the header, the image in full width, the comments and a fixed one-line comment box on the bottom. The user profile view now shows the complete larger header image, but the user photo is still square, although it is displayed as a circle in the stream. The circle view now also boasts a very handy new addition: a header with nine thumbnails of people and a tenth box with the number of users in the circle. Underneath is a settings button, which calls up a long-missing feature from the web interface: in the Android app it is now possible to adjust how many postings of the circle are seen in the main stream. This is also present in the community, it can be found when the header is expanded. There might be even more new features I have not yet discovered, I’ve heard that there are also new functions for moderating a community. I also don’t know which of these changes are present in the iOS version, since I’ve only used the Android app. All in all, it’s a brilliant update which makes many of the features from the web interface finally available on smartphones and tablets – and it shows how far developed Google+ on mobile devices really is in comparison to Facebook. The Android app also really works well on low-powered devices like my little Odys Xelio tablet – version 3.6 runs much smoother now and for some reason I was able to update it directly from the Play Store for the first time. But Google has also been a little lambasted recently for the introduction of Google Keep, a little Android notepad app, which directly syncs with a special new section in Google Drive and can also be used from the web interface. It just does what it says on the cover: keep notes, but you can also enter lists, take photos and insert pictures. The layout is like a post-it collection, and while the functionality is totally basic, not much more is really needed to make it a very handy little program which is ideal for taking short notes or even transferring small texts or web adresses from a computer to a tablet. Of course there are other apps like Evernote, Note Everything or Handrite, but Google Keep beats them all for sheer simplicity. Contrary to the popular opinion, the Mars Science Laboratory alias the Curiosity Rover is not actually looking for life on Mars, but for the conditions that could have life allowed to exist. And now it looks like this part of the mission was a success: yesterday NASA had announced the results of the drill sample taken earlier in February, saying that they measured sulfur, nitrogen, hydrogen, oxygen, phosphorus and carbon in it, some ingredients which could have formed life. And with the already established fact that Curiosity is actually standing in a dried-out riverbed, this could mean that microbacterial life had really once existed on Mars. After what Emily Lakdawalla had called the Curiosity Kerfuffle in December, when a few inadvertent words from a member of the science team had led the media believe that they had actually found evidence of life on Mars, the scientists have become very careful. The fact that they are now so absolutely sure about their really monumental discovery is a very good sign and it is not only possible, but very sure that they have now found the evidence they were looking for. But what does that mean for the mission? 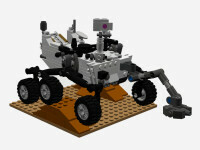 Actually, this will just be the beginning – the rover still has a long life ahead and many more samples will be taken and analyzed. Some additional media links: Emily Lakdawalla has a very detailed report up, Alan Boyle on his NBC Cosmic Log also, and of course there’s Universe Today and from the newspapers the Guardian and even Spiegel Online have shorter, but easier to understand articles posted. A surprisingly moderate reaction from the media, but this should really be much bigger news. There was so much going on at the South by Southwest convention-slash-conference-slash-festival over the weekend that it was hard to keep up with all the events over the web, so I just followed what the folks from CosmoQuest were up to. For the first time the whole crew – Fraser Cain, Pamela Gay, Scott Lewis and Nicole Gugliucci had all met in real life and they had a boatload of fun doing their science and astronomy outreach. 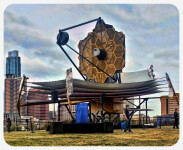 They hooked up with their friend Tony Darnell from Space Fans and did a lot of stuff – and all in the shadow of an enormous life-size model of the James Webb Space Telescope, which NASA had constructed on the convention site. Due to time and technical constraints not all of these events were actually shown live, but there were many tweets, blog postings and images (and together with Mike Rector, I was even able to help putting together some 3D images of the telescope model from images taken by Scott Lewis on the fly!). But there were some amazing hangouts: first the Space Science Hangout with about everybody from Cosmoquest, NASA and even Camilla Corona, the famous space chicken and mascot of the Solar Dynamics Observatory. Next there was Tony Darnell’s somewhat choppy, but still watchable broadcast of the (successful!) Guinness Book of Records attempt of the largest astronomy lesson ever. The last event from late Sunday night was, however, the best of them all: a Virtual Star Party live from SxSW in front of the JWST model with a real star party going on in the background, hosted by Fraser Cain, Scott Lewis and Tony Darnell – with some surprise Guests and, as usual, amazing images from telescopes all over the USA. Unfortunately this edition was a bit shorter than the usual hour because their laptop batteries were running low – but it’s still one of the most amazing virtual star parties ever held. About four and a half years ago, I first wrote an article in German about the disappointing articles written by the science department of Spiegel Online, one of Germany’s largest online magazines. The web branch of the venerable Der Spiegel has had a particularly troubled history of science reporting with a noticeable anti-NASA stance. Back in 2008, when the Phoenix Mars Lander had arrived on the red planet, the reporting was so negative that nearly everything the mission accomplished was put in a bad light and small problems were made into sensational catastrophes. Unfortunately in the last years, this trend has not only continued, but also been made worse with lazy and careless reporting. 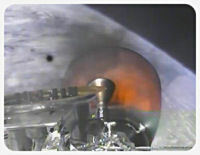 Eigentlich sah es zuerst nach einem richtigen Bilderbuchstart aus, als Space X gestern zum dritten Mal einen Dragon-Raumfrachter auf den Weg zur Internationalen Raumstation gebracht hatte. Schon nach weniger als einer Viertelstunde war die Raumfähre im Orbit, aber dann kamen die ersten Berichte von Problemen mit den Steuerungsdüsen. Es war wirklich ein kleines Drama, das man auch nach Beendigung der Live-Übertragung bei Nasa TV durch die Tweets von SpaceX-Chef Elon Musk verfolgen konnte. Es gab viel Spekulationen, über das, was passiert war und nicht zum ersten Mal liefen die Online-Medien ein bißchen Amok und die Gerüchteküche lief auf Hochtouren. Einen kühlen Kopf hatten wie immer die anderen Medien wie Phil Plait und Universe Today bewiesen. Während wie üblich Spiegel Online noch am Abend einen reichlich negativen Artikel online gestellt hatte, hatte sich die Lage schon längst wieder entspannt: gegen 22 Uhr deutscher Zeit hatte Space X gemeldet, daß alle vier Thruster wieder online waren und wenige Stunden später konnte auch der nächste Burn für einen komplett stabilen Orbit durchgeführt werden. 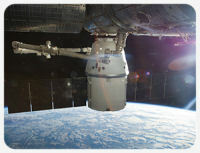 Inzwischen ist der Raumfrachter auch schon auf dem Weg zur Raumstation, wegen der Verspätung wird Dragon aber wahrscheinlich erst am Sonntag andocken können. [Update: Dragon wird um 12:01 CET an der ISS andocken! Und dann wars tatsächlich um 11:31 CET, eine Stunde als ursprünglich angekündigt – nach dem Einfangen mit dem Greifarm wird das komplette Docking jetzt um 15:40 CET / 9.40am EST stattfinden. (Auch wieder früher als geplant – der Raumfrachter hat jetzt angedockt!)] Space X hat nur das gemacht, was die Firma am besten kann: eine Krise schnell und professionell meistern – es war vielleicht zwischendurch ziemlich haarsträubend, aber letztendlich kein wirkliches Drama und auch keine Katastrophe. Es ist erst der dritte Flug von Space X zur ISS, aber auch diesmal dürfte der wiederverwendbare Frachter es zur Raumstation schaffen. Chris Hadfield wird sicher wieder via Twitter & Co praktisch live vom Docking und vom Auspacken berichten, ein Bild vom Start der Rakete hatte er sogar schon gepostet. [Kleine Korrektur: Live-Tweeten dürfte etwas schwierig sein, da Chris Hadfield derjenige ist, der den Greifarm zum Einfangen der Kapsel bedient!] Die faszinierende Live-Übertragung vom Start gibt es inzwischen auch bei Youtube. Währenddessen läuft auf dem Mars aber auch nicht alles rund: der Curiosity-Rover hat offenbar in einem seiner beiden redundanten Computer ein Problem mit dem Flash-Speicher und muß derzeit mit dem zweiten Rechner arbeiten. Eine wirkliche Gefahr für dne Mission ist das nicht unbedingt und wahrscheinlich läßt sich auch der angeschlagene Computer wieder in Betrieb nehmen. Aber trotzdem… gestern war ganz schön was im Weltraum los!